Europe Generator Sets Market size in 2017, was valued over USD 3 billion and is anticipated to grow over 6% by 2024. Rapid increase in demand for reliable power driven by the inadequacy of grid infrastructure will stimulate the Europe generator sets market growth. Ability to supply quality backup power during grid failure, power overdraw requirements and to support vital operations during fluctuating power supply will further enhance the product adoption. Burgeoning data center infrastructure coupled with rapid digitization across industrial sector will boost the Europe generator sets market growth. Growing adoption of gensets as backup power source across hospitals, IT and financial service firms, and other commercial spaces will have a positive influence on the industry landscape. The regional data center industry, led by France, Germany, the UK, and the Netherlands are demonstrating strong growth rate, thereby creating deployment prospects for gensets. 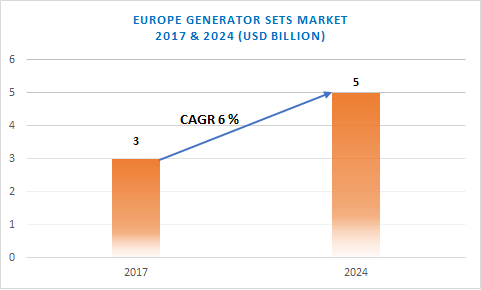 Europe AC gensets market will witness growth on account of growing dependency on electronics coupled with increased consumer awareness toward continuous & reliable power supply. These units are predominantly deployed across residential establishments on account of their lower maintenance requirements and operational suitability for small power ranges. Introduction of stringent government legislatives toward limiting greenhouse emissions and adoption of energy efficient systems will foster the Europe gas fired generator sets market growth. Additionally, the growing gas pipeline network across the region, and competitive fuel prices will complement the industry outlook. According to the European Commission, in 2016 the EU allocated funds of over USD 200 million toward the construction of Balticconnector, a gas pipeline between Estonia and Finland. Europe prime power gensets market is set to grow on account of growing construction activities driven by emerging trends in the real estate industry in the region. These generator sets are majorly installed across remote locations including construction sites, mines, and on O&G facilities, military areas where grid access is unavailable. The UK generator sets market will witness a robust growth on account of expanding IT & data center industry accompanied by the introduction of stringent data security regulations by the government. For instance, in 2018, the UK government introduced the Data Protection Act, with one of the objectives to ensure uninterrupted flow of information between the UK and the EU. Key players active across the Europe generator sets market include Cummins, Kohler, Generac, Honda, Yamaha, Caterpillar, Escorts among others.